Growing Their Own in Mozambique - Planet Aid, Inc.
International School Meals Day (ISMD) was celebrated with particular fanfare on March 9 in Mozambique. Children at primary schools across southern regions of the nation have been enjoying fortified school lunches for several years thanks to Planet Aid’s and ADPP Mozambique’s McGovern-Dole Food for Education Project (called "Food for Knowledge" locally). The steady supply of nutritious food has always provided a great reason to celebrate ISMD each year; however, this year there was even more reason to get excited. 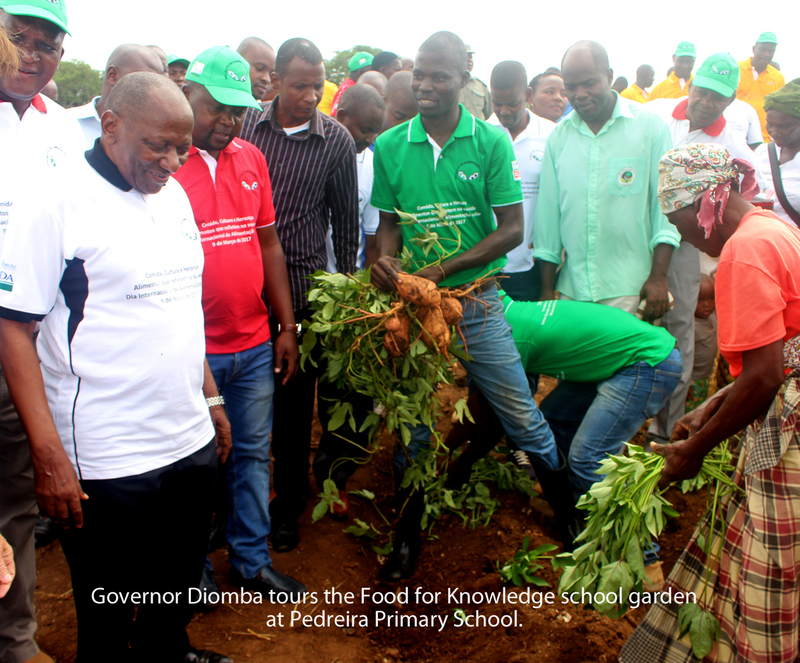 At the Pedreira Primary School in Matutuine District dignitaries gathered to celebrate the launch of the “Home Grown School Feeding Program,” a new component of Food for Knowledge. Attending the event were Raimundo Diomba, the Governor of the Maputo Province, Jorgete de Jesus, Provincial Director of Education and Human Development, Almeida Zacarias, Agricultural Specialist with the U.S. Department of Agriculture, and many others. The Pedreira school is one of eight participating schools in the Maputo Province selected to be a part of the new Home Grown Program, which is establishing small farms near the schools to produce corn, beans, vegetables, fruit from trees, and to raise livestock. The farms will supply food for local schools and the community and will serve as models for developing a comprehensive locally based school feeding program in the nation. 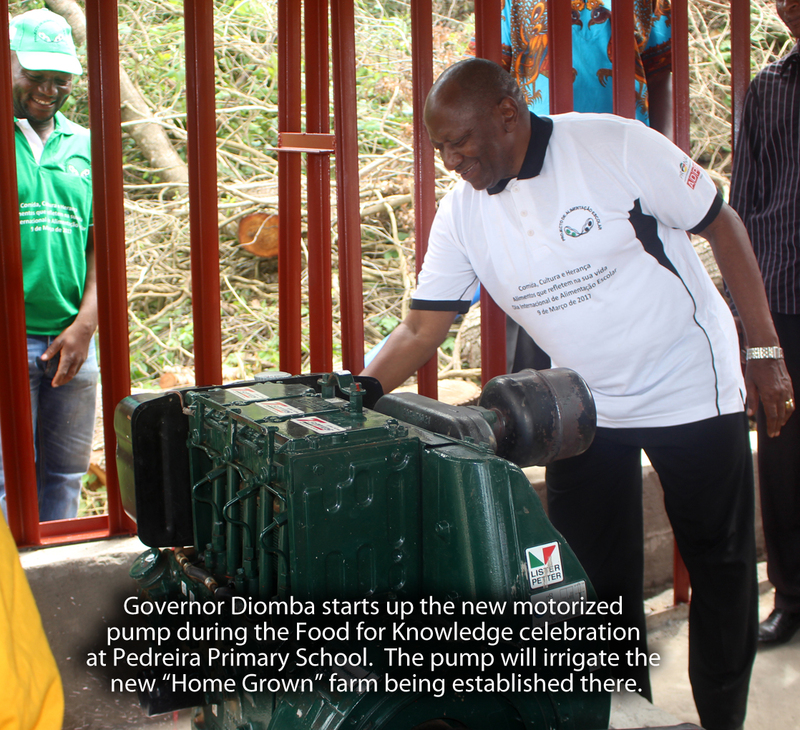 During the Pedreira event a new motorized water pump was installed and started up for the first time; the pump will be used to irrigate the farm. I am honored for being part of this ceremony, because when I first came here we launched the campaign of planting sweet potato branches, but we were still facing problems of access to water.... I am happy to see the achievements of the project. For the past few years, the Food for Knowledge Project has been distributing a nutritious corn-soy blend provided by U.S. farmers through the U.S. Department of Agriculture under the McGovern-Dole International Food for Education and Child Nutrition Program. The project, which continues until 2020, has been feeding children at approximately 270 schools and serving 12 million meals per year. Food for Knowledge has already established gardens at several of the participating schools, supplementing the protein-rich meals with leafy greens and other vegetables that add essential vitamins and minerals. The Home Grown farms take the concept of the school gardens many steps further, creating commercial enterprises to support the schools beyond the project's end. 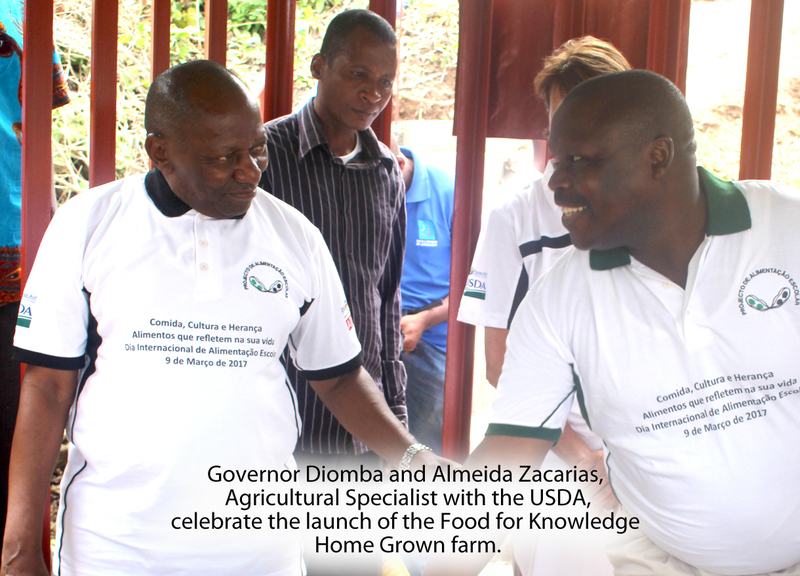 During the event, the dignitaries were also able to observe other aspects of the Food for Knowledge Project, including the newly built kitchen and warehouse and latrines. Click here to read more about Food for Knowledge.